More than a straight-up arts festival, Adelaide Fringe has arguably become the largest garden party in the world, and Gluttony's plans for 2019 could very well see it scoop the pool as the partiest garden of them all. 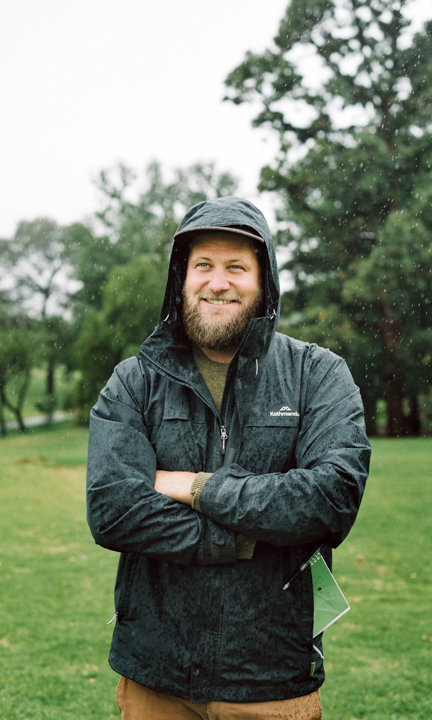 “Come rain or shine,” Gluttony’s new captain of food and beverages, Rowan Edwards says with a smile. It’s belting down with rain when we meet, but Rowan likes our idea of photographing him in situ where, this month, he and the team from Gluttony will have built a festival citadel for 9000 people. Captain of Gluttony’s food and beverage, Rowan Edwards, caught in a previous season. Photo: Tyrone Ormsby. The photo shoot is taking place on East Terrace, where one of Gluttony’s two food hubs will be located. East and West Market will counterbalance each other in 2019’s festival site and offer another level-up on the food and drink offering from the previous year’s festival. “2018 was my first with Gluttony and I came onboard late in the picture,” says Rowan. This year, however, Rowan is pushing a stronger food and drink theme throughout the venue. “We have incredible performers in our venues and it just makes sense to me to match that with more interesting and even experimental stuff on the food and drinks side of things,” he says. As evidence for what exactly he means by experimental, Rowan offers up the dedicated saké bar he trialled first at OzAsia’s Lucky Dumpling Market. It will be evolving for Gluttony and feature ticketed saké masterclasses by Brett Goss from Shōbōsho. You can expect high-end, weird and wonderful artisan sakés from Black Market Saké, Sapporo on tap and – fingers-crossed – a little yakitori BBQ operation for good measure. Pop-up Fringe venues usually have to sign their lives away to one of the big liquor suppliers, which then diminishes the diversity on the venue’s drinks lists. But with a bigger geographical footprint next year and greater capacity, Rowan has been able to negotiate with their first-pour partners to create a small, independent wine bar inside Gluttony. “It’ll be called Local Bar and we’re going to have a focus on SA producers and some of the fringier winemakers out there, lesser known and – in my opinion – more interesting,” says Rowan. Gluttony’s director Daniel Michael can’t join Rowan at the interview. He’s busy getting ready for another huge festival his company is putting together down in McLaren Vale. We pick up with him over the phone for some of the specifics about Gluttony 2019. Stay tuned to CityMag for future Fringe and Festival coverage. You can sign up to our weekly newsletter here. “There’s going to be 12 venues in the park and 150 shows over the month of Fringe, ” he tells us. Daniel is happy with the shows Gluttony has secured, and you can rest easy in the knowledge Hans will be returning to Gluttony in 2019. Yes, despite his success on America’s Got Talent and his pending negotiations with Las Vegas Casinos, Hans will be back. It’s true. Fringe is not about long-term commitment. It’s good while it lasts, but if it went on much longer you’d surely start feeling like a bit of a glutton.